The signature of ADDCAR Highwall Mining is the unique Cascading Conveyor system that uses high speed open conveyors that overlap to feed coal from the miner to the stacker conveyor without increasing fines. Each car has its own conveyor drive motor (over 1hp per foot of belt) and starter box. Starter boxes are sequenced car to car so that if one stops they all stop, belt direction can be reversed on all, and they can be sequentially started (outby first to inby last) from the operator’s cab. 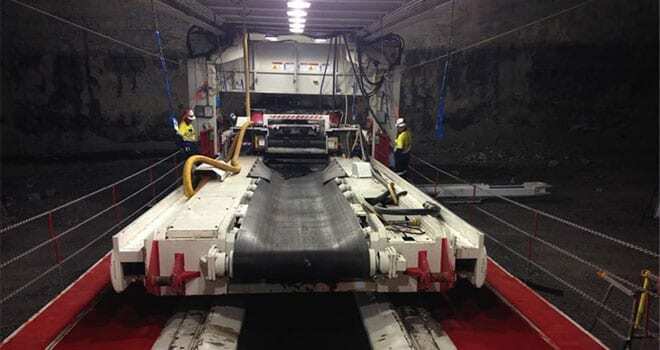 As the miner works its way into the seam, an end loader places Conveyor Cars onto the launch vehicle, where they’re hooked up without interrupting coal flow. This makes the ADDCAR highwall mining system the only true continuous mining process above or below ground. In addition to carrying coal to the stacker, Conveyor Cars are the mechanical link between the launch and the miner that allow the system to be pushed by the launch while simultaneously being pulled by the miner and vice versa.